Top-Rated SellerMsMagical consistently earns high ratings from buyers thanks to fast shipping and excellent service. Hi, My name is Elaine, and I am a Celtic Shaman, Reiki Master, Wise One, Atlantean High Priestess, Elemental Soul and Living Master. I specialize in Spiritual Healing's utilizing various techniques. My services are designed with your highest spiritual good in mind. 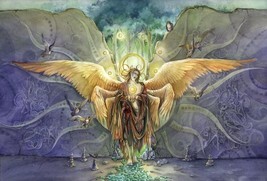 For this offering, you will recieve 3 messages form the Archangels to assist you on your spiritual path. You will recieve your Angel Messages in your inbox within 48 hours of completed payment and purchase, although, usually sooner.